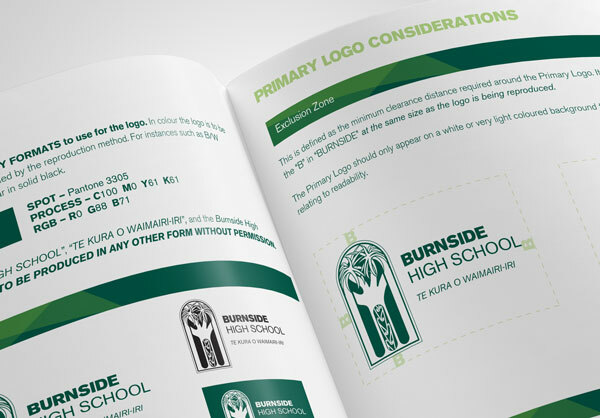 The Burnside High School logo symbol is iconic among schools in the Canterbury Region and beyond. Yet there had never been any guidelines established to help staff and suppliers use it in a consistent way. They decided themselves on how it would appear. To fix this we went back to the beginning and created some visual standards around how the logo should primarily look, followed by a set of guidelines for applying the logo in different circumstances. 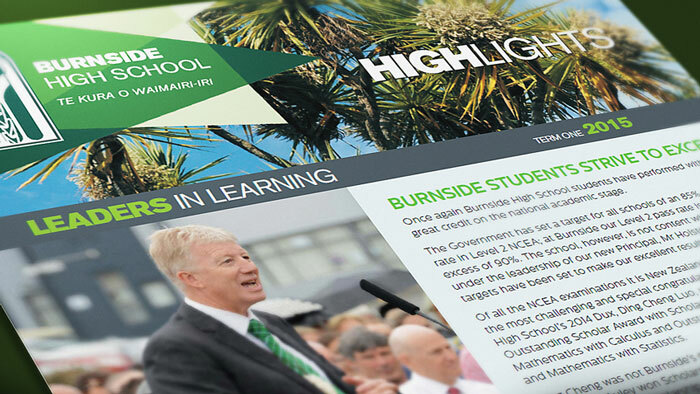 Burnside High School - A Beacon of Learning Excellence on the Educational Landscape. When Pre-European Māori travellers looked down upon the Canterbury plains from Rāpaki and Te Waihora, on their way to the Ngāi Tahu pā of Kaiapoi, they looked for a grouping of cabbage trees in the distance. These signified a safe passageway through the swampland and provided a place to rest before embarking on the remainder of their journey. The Māori called the cabbage tree ti kōuka which means "footprints in the landscape". The first trees have long since disappeared but more grew and take pride of place in the Burnside High School grounds. When students enter the school at Year 9 they are educated on their significance, and symbolic importance. The cabbage tree is a visual metaphor representing Burnside High School - a place of learning excellence that stands out on the educational landscape. PB4L and its Influence on the Burnside High School logo. 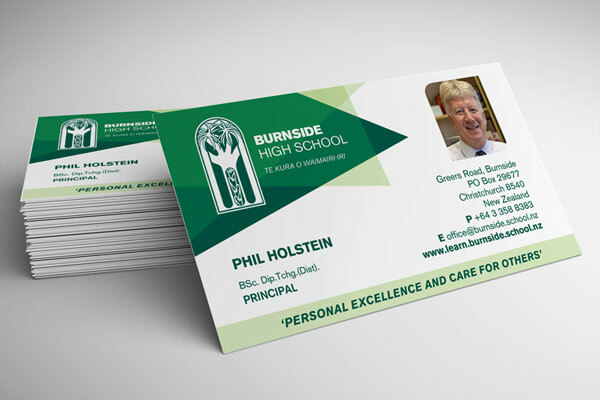 Toward the end of 2014 I was asked by senior staff at Burnside High School to help develop a logo and some promotional branding for their PB4L Values Program called BHS. I began by researching the cabbage tree in their school crest, what it meant, and how I could use this information to develop the look for the BHS logo. During the conceptual phase of the branding process one thing became very clear. If the cabbage tree was symbolic of the school, then its long leaves represented the school values "woven" into the fabric of Burnside High School. This idea helped direct the way the PB4L logo would look. The cabbage tree fibre was known for its strength and durability. Māori would weave the fibrous flax fronds together to make kete (bags) and paraerae (sandals) for the journey ahead. The letter forms are designed to have a similar woven overlapping feel about them. 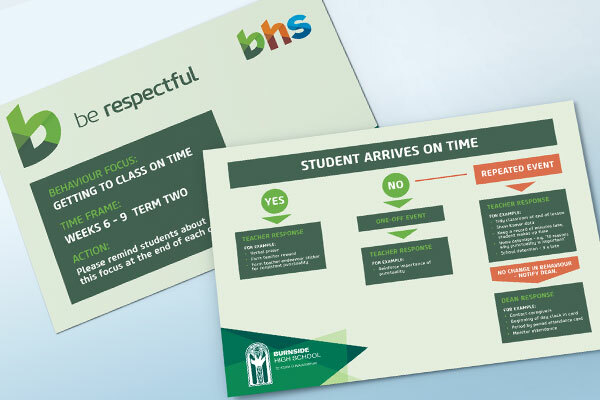 BHS helps prepare students to become better citizens now and in the future. 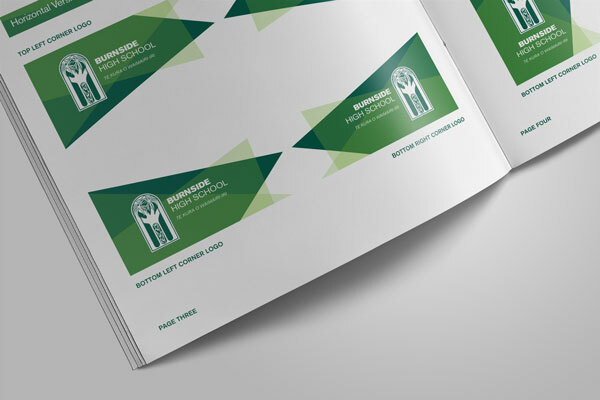 As a result of the background work that went into developing the PB4L logo we were then able to apply similar styling to a background for the school logo to appear on - linking the two logos as well as the story binding them together. 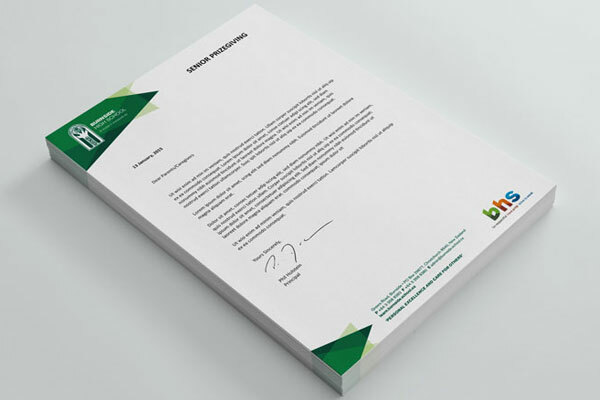 A School Branding Style Guide was created to provide the necessary guidance suppliers and staff needed for incorporating the logo into printed or digital material. Shown below is how the logo is being used on school signage and their newsletter. 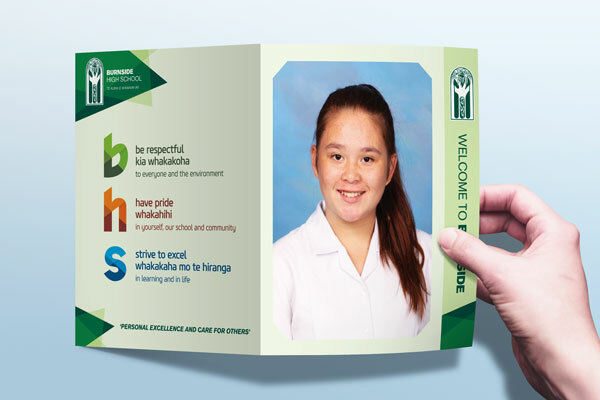 Burnside High School is a great example of a school, with a logo that didn't require any updating, taking a step back and refocusing on their unique attributes and traditions. We were then able to create a fresh look for the logo that was more aligned with the meaning behind it, as well as a clear set of guidelines for applying it correctly. What is the story behind your school logo? 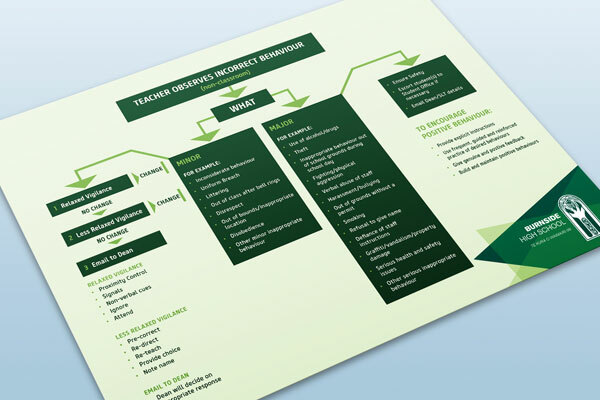 Does your school branding appear in a consistent way across all of your school's brand identity assets such as your prospectus, signage, and website? Is there confusion about how the logo can and cannot be used? 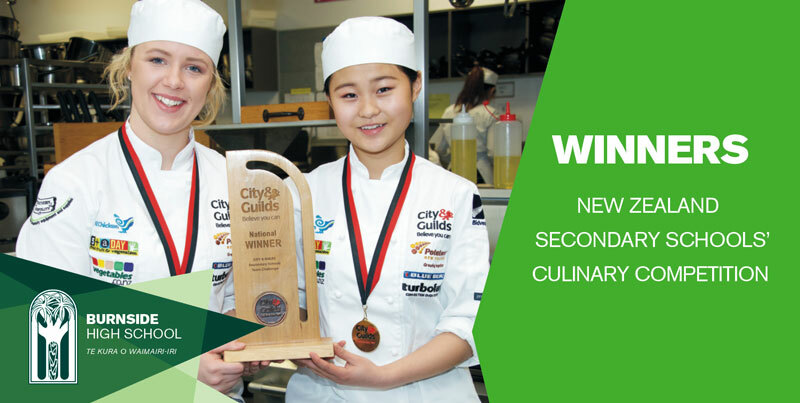 Do you need some clarity and consistency around your school branding? Having this goes a long way toward developing brand recognition in your community - drawing attention to your school and the programs you offer.